TV, radio, traffic, telephones, pagers - our minds are bombarded daily by constant noise and clutter. No wonder so many people find it increasingly difficult to listen and comprehend. Simple pieces of information such as names go "in one ear and out the other." Poor listening may have tragic consequences such as the Challenger disaster and the Potomac River crash of 1982, or it can result in smaller tragedies such as lost promotions, stalled marriages, and troubled children. 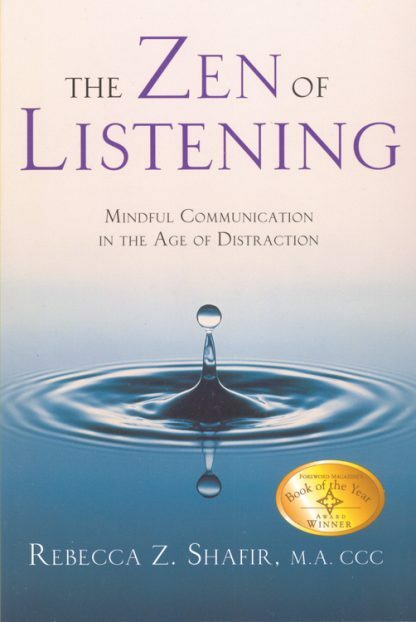 Rebecca Shafir assures us that we can transform every aspect of our lives, simply by relearning how to listen. The Zen of Listening is grounded in the Zen concept of mindfulness, a simple yet profound way of learning how to filter our distractions and be totally in the present. Rather than a list of tricks, this book is an all-encompassing approach allowing you to transform your life. Readers will be amazed at how simply learning to focus intently on a speaker improves the relationship, increases attention span, and helps develop negotiating skills. Learn the great barricades of misunderstanding, find out how to listen to ourselves, discover how to listen under stress, and boost our memory. This is a fun and practical guide filled with simple strategies to use immediately to enjoy our personal and professional lives to the fullest. Rebecca Shafir, M.A., CCC, is a certified speech/language pathologist at the Lahey Clinic in Burlington, Mass. A ten-year student of Zen, she teaches communication workshops nationwide and has coached media personalities and political candidates since 1980. She is available to present a variety of programs ranging from keynote addresses to weeklong seminars tailored to meet the individual needs of corporations, health-care institutions, professional associations, universities, and the general public.